Tony Parsons, OAM, has worked as a professional sheep and wool classer, a journalist, news editor and rural commentator, a consultant to major agricultural companies, and an award-winning breeder of animals and show poultry. He owned his first kelpie dog in 1944, and in 1950 established 'Karrawarra', one of the top kelpie studs in Australia. 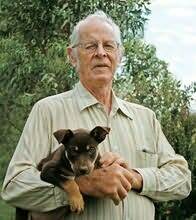 In 1992 he was awarded the Order of Australia Medal for his contribution to the propagation of the Australian kelpie. "RJ Bailey has created a serial hero to rival Jack Reacher himself."